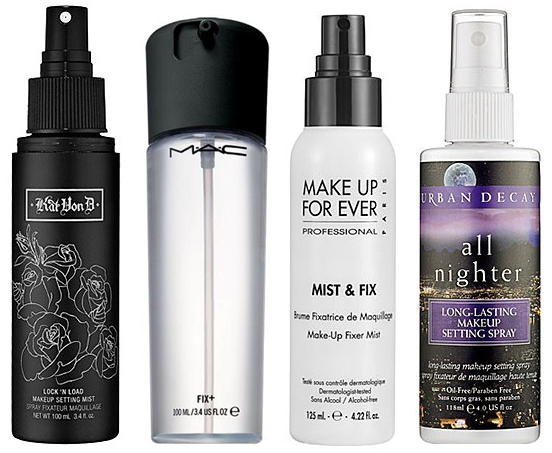 A makeup fixing spray is a spray that you use to help make your makeup last longer or to make your foundation & powder look less powdery & cakey. It also helps your foundation last longer. Some setting sprays are just like cucumber water, rose water, mineral water etc – refreshing, moisturizing sprays that will help almost melt your makeup into your skin making it a little less matte and foundation looking. Great for dry skin! It sort of creates a thin barrier around your makeup so heat, weather, humidity, sweat, etc won’t make your makeup slide off your face. Great for the summers! 🙂 The way to use this is by spraying it at one arm’s distance on to your face & then letting it dry on it’s own. Do not wipe/dab with a cloth or tissue. The product needs to get into the skin for it to work! should I use this spray before applying the makeup?? Aniti, you can use the setting spray before, in between or after makeup. It is not going to ruin your makeup. After spraying allow it to dry out by itself on the face. Thanks a lot…one more query, which setting spray do you suggest for normal skin? The Body Shop Vitamin C Energizing face spritz & MAC Fix+ are two great setting sprays. Don’t over spray as it would make your skin oily otherwise. The Body Shop one is more concentrated, so spray just 3 times from a distance where as MAC Fix+ can be sprayed around 5-6 times all over.